Home > Self Defence > How Young is Too Young to Start Self Defence Classes? When it comes to the question of when is too young to start self defence classes, the answer is, never, really. Children can be exposed to self defence as early as they can kick a ball around or run in a straight line – they do not even have to understand what self defence is all about. In fact, if they are very young, it is actually far more conducive to allow them to have fun and not explain why they might need self defence in the future. And many places actually run family classes so the children, their siblings and parents can all take part and learn together. If your child is younger than five, they can take part in self defence classes, providing there is a school near you willing to offer lessons for children so young. At this age, they will not be taught about kicking or lunching or throwing – but rather how to out the building blocks in place that will then enable them to learn things such as this a few years down the line. This could include such skills as teamwork, so the children know how to work with others, or balance, so that when the time does arrive for them to start learning to kick, they do not fall flat on their face. As children get a little older, skills can begin to be brought in. That does not mean they are going to be taught how to fight, but they will start to have a sense of discipline instilled in them. This is important for when they do start learning to fight so that they know exactly when to use the skills they are being taught and to never lash out in anger or on impulse. Other skills which they will start to learn at this age is co-ordination – making their arms and legs do the things they want to them to do at the right times. A certain level of fitness will also be introduced with the children getting used to the idea of conditioning and training. Once your child gets to the age of eight and above, the focus can shift to beginning to tailor their skills and start to learn the mechanics behind the sport. Of course, all children will progress at different levels so there is no one size fits all approach. But a child aged eight and above can start to appreciate the sport for itself and know that they need to concentrate in class to build their skills and get better. Children of this age can even start to think about entering competitions once their skills reach the required standard. 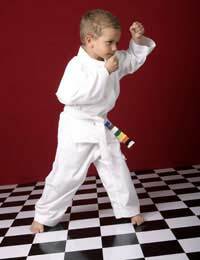 Self defence classes are an excellent idea for children of all ages, just as long as the class is designed for the appropriate age. If the child goes to the wrong age class it could out them off forever or teach them inappropriate things for their age range. But if they go to the right one, they could start a lifetime love affair with sport and fitness – not to mention do their self esteem the world of good.